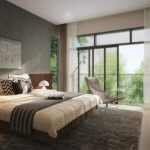 City Development Pte Ltd (CDL) brings to you Whistler Grand CDL, the latest new residential project in the West Coast Vale area. 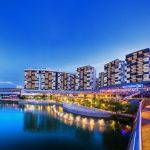 This is located in a private housing estate on the fringe of the Jurong Lake District (JLD), that is planned to be the 2nd CBD of Singapore. The Whistler Grand condo development will comprise 716 housing units in two 36-storey high towers on the 210,883 square foot parcel of land. It joins other CDL projects in the West Coast area, such as Monterey Park and Hundred Trees, that have been well-received, and continue to be highly regarded for their quality and design attributes. CDL has a great team, with a time-tested reputation for delivering quality products. They have also been very selective in the projects they invest in. They chose the Whistler Grand site as they see value in this location, and a lot of future potential given its proximity to the JLD (that will continue to develop into a major business hub even without the High Speed Rail to Malaysia). While the site is not within walking distance to an MRT station currently, the construction of the Jurong Region Line (East) will bring one nearer by 2027. The Pandan Reservoir MRT station will be roughly 15 minutes walk away then, beside Pandan Gardens. 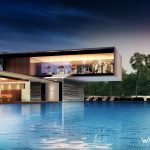 The Whistler Grande VIP Preview starts from 20 October 2018. This augurs well for the success of the launch, as there will be little competition in the vicinity. Parc Riveria is completely sold out. Twin VEW that launched in May 2018, was already 86% sold as of end August 2018, and in fact had only the bigger units left. There will likely be pent-up demand, especially from buyers looking for one or two bedders who did not manage to get a unit at Twin VEW. At the same time, since the remaining 3 to 5 bedroom units at Twin VEW are priced at around $1,450 to $1,550 average PSF which is close to what analysts are expecting for the Whistler Grand condo, there will be some demand for these too. 21 October 2018 Update: For the VIP Preview early November, CDL will launch at $1,380 PSF average after all Early Bird Discounts, below previous analysts’ estimates. The Whistler Grand condo is located on the outskirts of the Jurong Lake District. While the plan for the High Speed Rail (HSR) between Singapore & Kuala Lumpur has been put on hold, there is a possibility it could be revived in future. 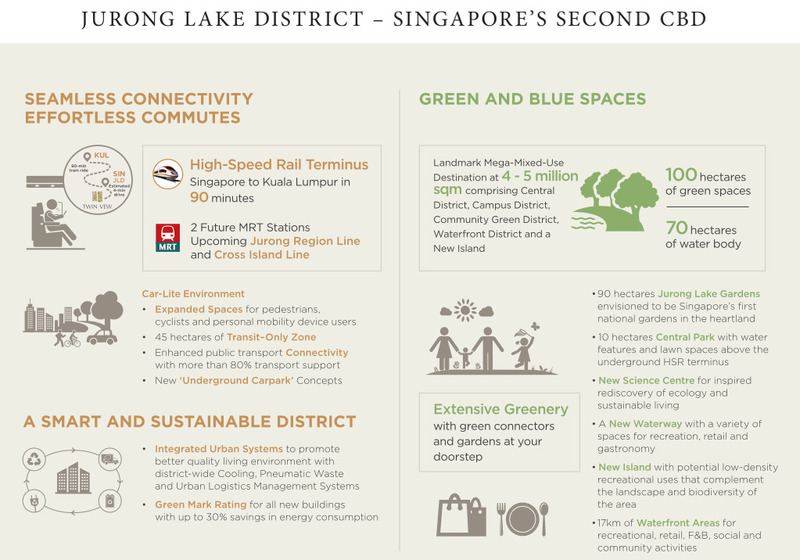 Here is what is envisaged for the 2nd CBD of Singapore, which is a lot more then just the HSR. 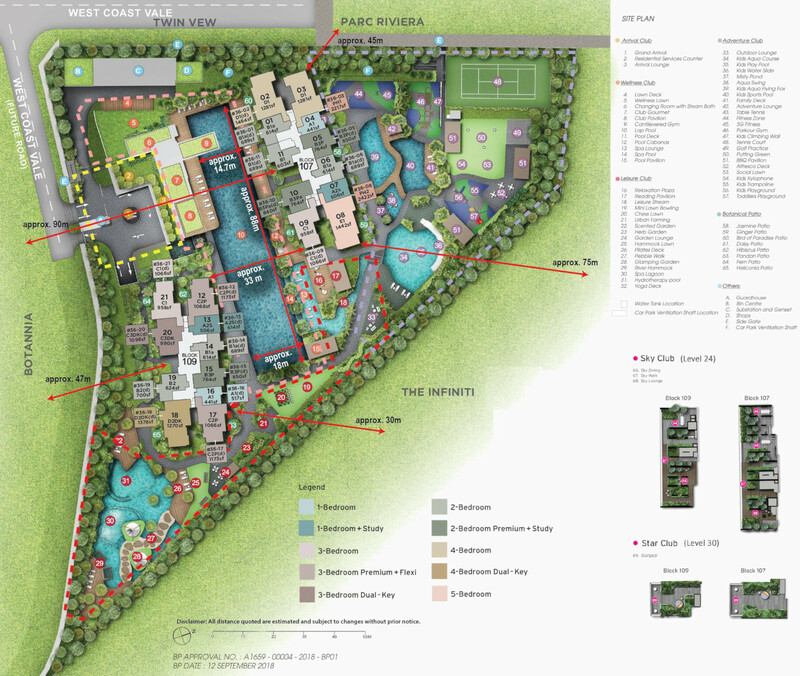 The draft Whistler Grand floor plan layouts are available. Kindly drop us a note in the Contact Form if you wish for the Whistler Grand condo floor plans to be sent to you. 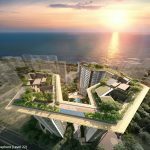 The twin 36-storey towers at Whistler Grand Singapore soar above lushly landscaped grounds and resort-like facilities with lots of water features. At higher levels you get views of the nearby reservoir and even all the way to Bukit Timah Hill in the distance. From the unblocked orientations residents may hear the whistling of wind, especially at the sky garden levels. Hence the name Whistler Grand. The Whistler Grand site is a 210,883 square feet triangular parcel of land. 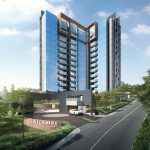 It is tucked into a private condominium housing estate, almost completely surrounded by four other developments: Parc Riviera and Twin VEW to the west, Botannia to the south, and The Infiniti half shielding its north-east boundary from the AYE (Ayer Rajah Expressway). The allowable plot ratio is 2.8, a mid-density ratio. This means that for every square foot of land, the maximum permitted built in area is 2.8 square feet. By going up to 36 storeys, this frees up more of the site for landscaping and facilities. It produces a less crowded, more spacious feel. Besides the facilities on the ground level, there are sky terraces / lounges as well, at the 24th and 30th floors. The Whistler Grand condo showflat is available for viewing appointments. Please drop us a line below if you wish to view the Whistler Grand showflat. Here are the Whistler Grand price ranges as at 12 January 2019. Please contact us via the Contact Form if you would like to know latest price ranges or to view the showflat. The Whistler Grand land plot was launched for public tender on December 19, 2017 under the second half 2017 Government Land Sales programme. 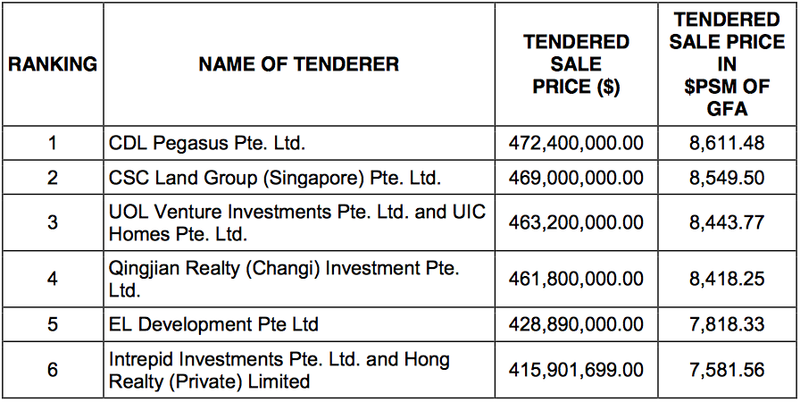 CDL Pegasus, a unit of City Developments (CDL), won it by the skin of its teeth with a top bid of SGD$472.4 million, barely 0.7% ahead of its nearest competitor China Construction (South Pacific) Development. The top 4 bids were actually very close, all at above $460 million. CDL’s winning bid for the Whistler Grand condo site works out to a land rate of $800 PSF PPR (per square foot per plot ratio). Analysts have estimated the break even cost at around SGD$1,250 to $1,300 PSF, with a possible selling price of between SGD$1,450 to $1,550 PSF. 21 October 2018: For the VIP Preview early November, CDL will launch at $1,380 PSF average after all Early Bird Discounts, below previous analyst’s estimates. 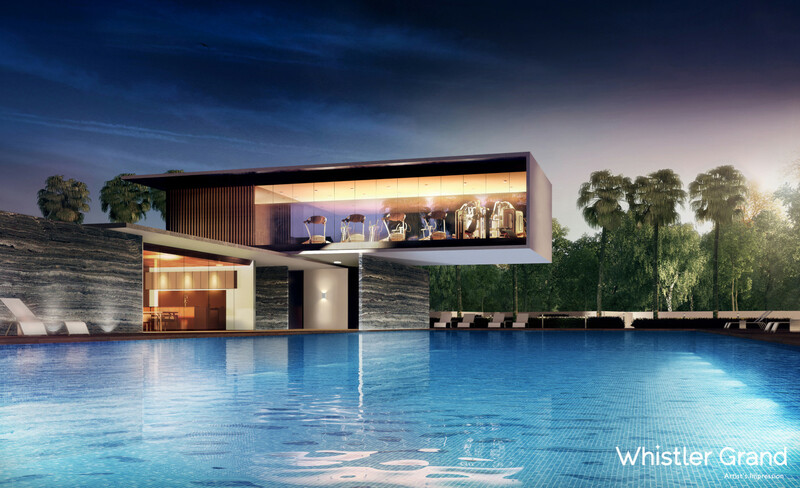 The Whistler Grand condo is being developed by CDL Pegasus, a fully owned subsidiary of City Developments Pte Ltd. Established for over 50 years in Singapore since 1963, City Developments ranks among its top real estate developers. It is also a listed international property and hotel conglomerate, with interests in real estate investment and development, hotel ownership and management, and in facilities management. CDL encompasses an extensive network of over 300 associated companies and subsidiaries across 100 locations in 28 countries. These include 7 companies listed on stock exchanges in London, New Zealand, Hong Kong, and the Philippines. 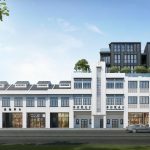 At home in Singapore, CDL has a reputation for quality work, and an impressive track record of having built over 23,000 homes ranging from the mass market to the high end real estate sectors. Its projects are almost too many to count. 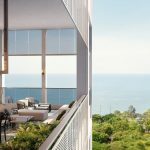 Among them are names such as the One Balmoral, Gramercy Park, New Futura, St Regis Residences, Bartley Residences, Cliveden @ Grange, One Shenton, Echelon, Nouvel 18, and South Beach Residences. Location. 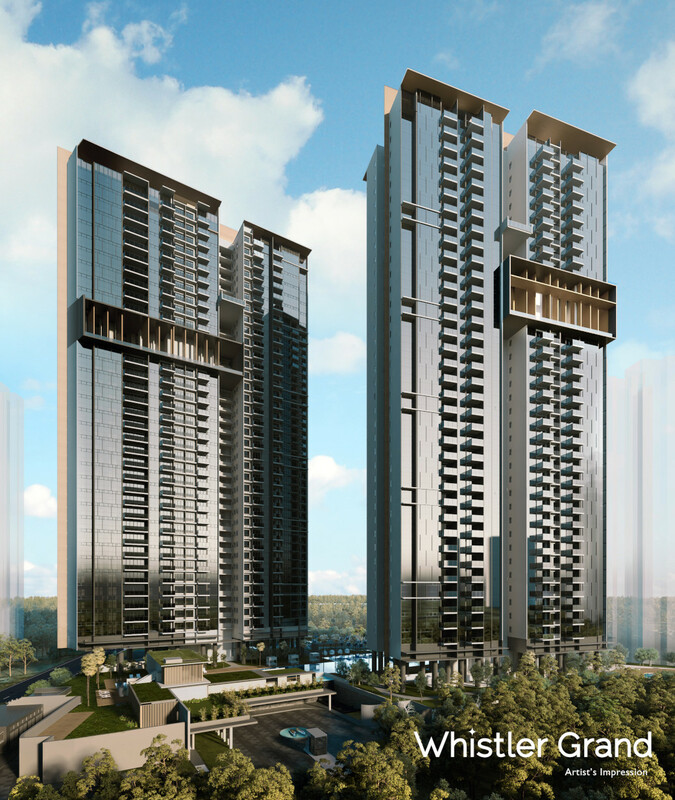 The Whistler Grand location is at the edge of the Jurong Lake District (JLD). As part of the URA Master Plan, this area is being developed into a major residential, business, leisure and hotel hub, to be Singapore’s 2nd CBD (Central Business District). Shops, Dining, Banks, Supermarkets. The Whistler Grand location is in an essentially private residential area, with no commercial centres within close walking distance. But from the bus-stop 3 minutes walk away along the AYE, you can take buses to JGateway and its cluster of malls like JCube, JEM, Westgate, and BigBox, and to Clementi Town Centre too. Closer at hand are the Ayer Rajah Food Centre, and the Teban Gardens Road Market and Food Centre. Integrated medical care is also comfortingly near to hand too, at the Ng Teng Fong Hospital. Nearest MRT Station. 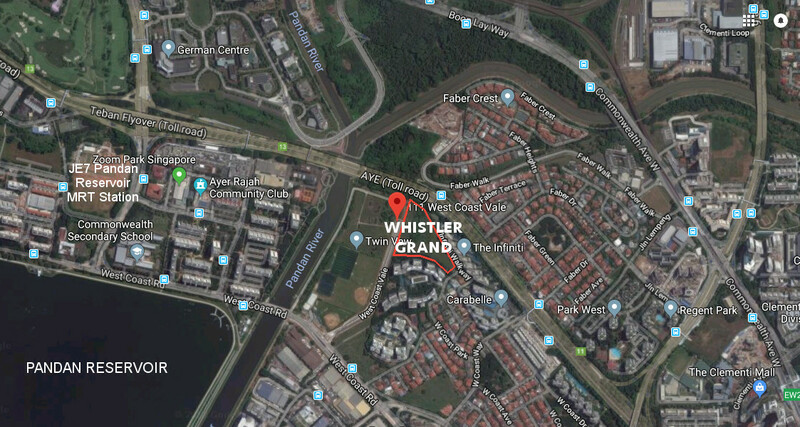 A the moment the Whistler Grand location is not within easy walking distance from any MRT station. The nearest is Clementi station, a 28 minute walk away. 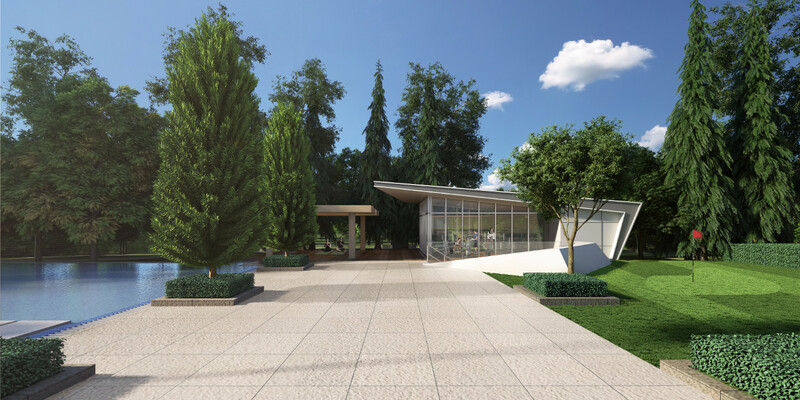 But the Pandan Reservoir MRT station on the Jurong Regional Line which is slated to complete in 2027, will provide a station within 15 minutes walk, at the Pandan / Teban Gardens estate. Schools. Primary schools within the all important 1km radius include Nan Hua Primary, and Qifa Primary. Beyond that within 2km are Clementi Primary, and Pei Tong Primary. The Whistler Grand location is actually near to an education cluster, that includes institutes like the NUS High School of Mathematics and Science, the National University of Singapore (NUS), and Singapore Polytechnic. As well as international schools such as the United World College of SEA (Dover campus), Japanese Kindergarten, Primary and Secondary schools, and the Lakeside campus of the Canadian International School. Accessibility. The Whistler Grand location is accessed via West Coast Highway, a straight road that leads to the MCE (Marina Coastal Expressway) via Keppel Viaduct, to join the KPE and ECP. Off-peak it would only take 30 minutes to get to Changi International Airport. 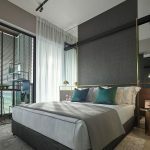 The West Coast Highway will also take you via the AYE (Ayer Rajah Expressway) to Jurong Town Hall Road that leads to JGateway and its leisure and healthcare centres, malls, offices and banks, and a host of other amenities.